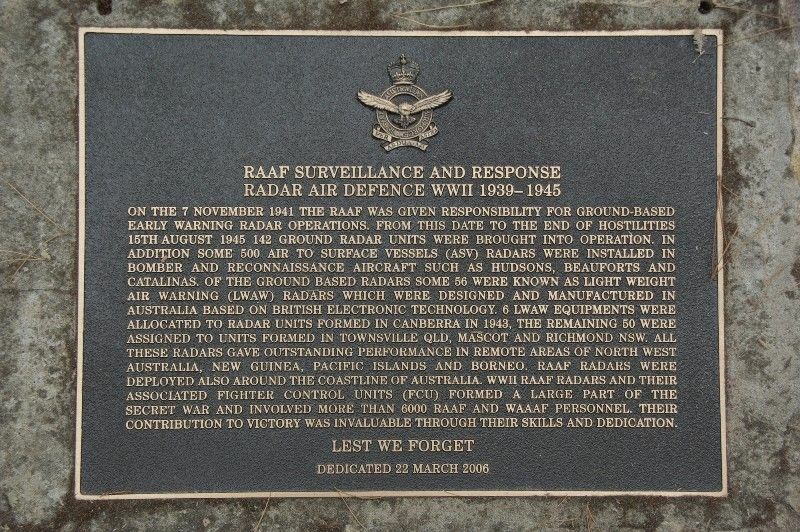 A plaque commemorates those who served with Royal Australian Air Force Surveillance & Response Radar Defence during World War Two. ON THE 7 NOVEMBER 1941 THE RAAF WAS GIVEN RESPONSIBILITY FOR GROUND-BASED EARLY WARNING RADAR OPERATIONS. FROM THIS DATE TO THE END OF HOSTILITIES 15TH AUGUST 1945 142 GROUND RADAR UNITS WERE BROUGHT INTO OPERATION. IN ADDITION TO SOME 500 AIR TO SURFACE VESSELS (ASV) RADARS WERE INSTALLED IN BOMBER AND RECONNAISANCE AIRCRAFT SUCH AS HUDSONS, BEAUFORTS AND CATALINAS. OF THE GROUND BASED RADARS SOME 56 WERE KNOWN AS LIGHT WEIGHT AIR WARNING (LWAW) RADARS WHICH WERE DESIGNED AND MANUFACTURED IN AUSTRALIA BASED ON BRITISH ELECTRONIC TECHNOLOGY. 6 LWAW EQUIPMENTS WERE ALLOCATED TO RADAR UNITS FORMED IN CANBERRA IN 1943, THE REMAINING 50 WERE ASSIGNED TO UNITS FORMED IN TOWNSVILLE QLD, MASCOT AND RICHMOND NSW. ALL THESE RADARS GAVE OUTSTANDING PERFORMANCE IN REMOTE AREAS OF NORTH WEST AUSTRALIA, NEW GUINEA, PACIFIC ISLANDS AND BORNEO. RAAF RADARS WERE DEPLOYED ALSO AROUND THE COASTLINE OF AUSTRALIA. WWII RAAF RADARS AND THEIR ASSOCIATED FIGHTER CONTROL UNITS (FCU) FORMED A LARGE PART OF THE SECRET WAR AND INVOLVED MORE THAN 6000 RAAF AND WAAF PERSONNEL. THEIR CONTRIBUTION TO VICTORY WAS INVALUABLE THROUGH THEIR SKILLS AND DEDICATION.